Cotton Candy Baby Pink Furry Leg Warmers with Gold Glitter tinsels! The softest, fluffiest, longest hair furry leg warmers around! 100% hand Professionally made from ONLY The BEST quality longest haired, Fluffiest Faux fur. 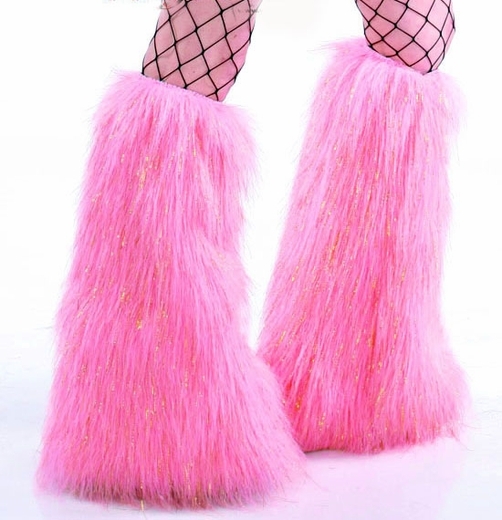 These Fuzzies are super long and flared, they have an elastic band sewn at the top (can be worn shown out or hidden - tucked in) To keep them from slipping down while you�re dancing, walking, running or plainly partying the night out at the club. They are one size, about 19 inches long, will fit both man and woman (Stretchy elastic will Fit most calfs, let me know if you think you might need a custom size or length). Add them over your boots, sneakers or platforms to complete your gorgeous outfit!